We want all children to feel safe and loved at our church. Because of this we follow the United Methodist Church's Safe Sanctuaries policy of having two adults with our children at all times. We use the Orange strategy and resources in our Children's Ministry to help families partner with the church in helping families win. Beginning at 10am through 11am we offer supervised play in our Nursery for children under 3 years old. 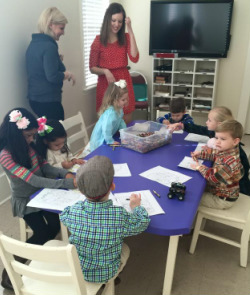 We offer a more formational program for our children from 3-8 years old that begins at 10am. If you are joining us just for 11am worship we encourage families to worship together for the beginning of the service and then invite all the children to Children's Church about 15 minutes into our 11am service. If you have any specific question please contact us.